Did a recent graphic by the anti-gay, pro-religious-freedom American Family Association make their intentions a little too clear? The American Family Association (AFA) proudly describes itself as one of the largest and most effective “pro-family” organizations in the United States. This doesn’t mean that AFA advocates for healthcare or paid family leave or family planning or education funding or laws that protect abused children, or aid to dependent children, or other evidence based services that promote family flourishing. Nope; it means they use their legal clout and broadcast media to oppose gay rights in places like Indiana, obstruct access to abortion care, repeal universal healthcare, and defund public services and regulations. Politically, a president with sufficient courage and will can almost single-handedly engineer a political revolution his first day in office. He can, beginning on day one, revoke every single one of our current president’s misguided executive orders. He can use legitimate executive orders to shut down the unconstitutional and unauthorized dictates of every single executive branch agency, beginning with the EPA. He can insist that immigration laws be vigorously and immediately enforced. He can insist that a double layer security fence be built along our southern border as the law already calls for. He can veto budgets that provide any ongoing funding for amnesty. He can veto budgets that furnish taxpayer money to abortion providers. He can veto budgets that spend any taxpayer dollars to promote anything other than abstinence and man-woman marriage. He can veto budgets that fund ObamaCare, increase federal spending, fund wasteful welfare programs, or impair our national defense. You might think it odd that these “pro-family” policy priorities align so poorly with the pro-family priorities of, say, Moms Rising, which include things like maternity and paternity leave, flexible work, toxin free environments, healthcare, childcare, sick leave, and nutritious food—but the Lord works in mysterious ways. One of those divine mysteries is why the AFA’s pro-family priorities have included long and passionate advocacy to ensure that evangelical fundamentalist military officers and NCO’s are free to proselytize their subordinates. The Military Religious Freedom Foundation, which goes head to head with AFA in this arena, takes a different position. Their lawyers argue that permitting a commanding officer to promote his or her beliefs or church can create a hostile work environment for soldiers who may have other spiritual beliefs and priorities. 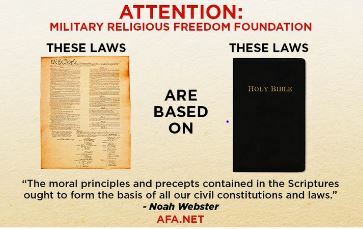 Soldiers who have reached out to the Military Religious Freedom Foundation for assistance in dealing with religious boundary violations include Pagans, atheists, Muslims, Jews and thousands of mainline Christians who don’t share the fundamentalist view of the Bible. After butting heads with the AFA, the Military Religious Freedom Foundation took out a full-page ad in the AFA’s hometown newspaper. 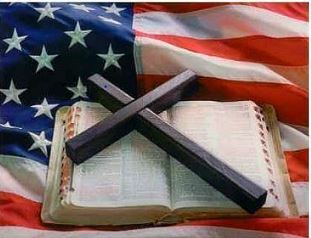 It depicted the Preamble to the U.S. Constitution next to a Bible, with the words USA Law above the former and AFA Law above the latter. 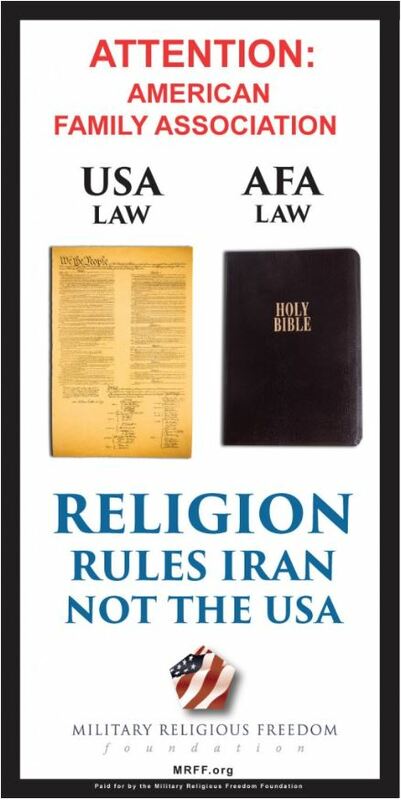 Bold letters beneath declared, RELIGION RULES IRAN, NOT THE USA. But not long after it was published, the Constitution-Bible graphic disappeared, along with any mention of the controversy. So one can’t help but wonder which line, exactly, the Constitution-Bible graphic crossed. Was it the historical inaccuracy—the bogus claim that the Constitution is based on the Bible? Or were AFA’s theocratic intentions a little too quotably clear? Or was it that they didn’t want anyone being reminded, even indirectly, of the parallel between their ideal government and that of Iran? Update: As of 6:30 p.m. on April 8, the graphic is up at the AFA website with a notation that the post was last updated at 2:35pm. Gallery | This entry was posted in Christianity in the Public Square and tagged Bryan Fischer, Mikey Weinstein, Military Religous Freedom Foundation, religous freedom. Bookmark the permalink. You have some seriously weird people in the US of Eh? AFA’s views are indeed extreme. I ask myself if the ground has become more fertile for fundamentalism in the US or if it is that the action of minorities are getting more extreme… In any case, worrying situation, because both lead to much sufferings. Robert I. Sutton’s point about the path to the less violent “human race” (and according to him more “sustainable” human) which goes through the daily expression of strength from those who are tolerant, those who embrace diversity is here and again particularly relevant. I continue to maintain that it is in the small daily actions of strength by each of us against violence and abuse and for awareness and transparency that we will slowly address the manifestations of fear and desperation which are the fabric of fundamentalism. And as always, many many thanks Valérie. Both, probably thanks to the internet. Extremists can get their message out and attract others of like-mind. Plus, there’s a whole news network that promotes a lot of their idiocy. When I [correctly!] 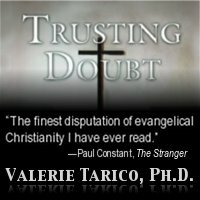 state that many Christian fundamentalists desire a government comparable to that of Iran, it often strikes a negative note. Apparently, the suggestion that a large number of Americans may advocate a view antithetical to democracy is too scary for many. However, the denial is even scarier! The writer of Matthew puts these words in the mouth of Jesus, “And why behold you the mote that is in your brother’s eye, but consider not the beam that is in your own eye?” How ironic that Bible worshipers can’t get this. Hi Valerie – great post… again. What a mind! That being said, I wish to repeat something so simple, so obvious, it seems few can get it. “Bible worshippers” as called care not a whit about what Jesus said. Like any fundamentalist power, their dead gods, godlings or prophets are just convenient icons, and just as inconvenient to hear, so they choose not to hear. ABC’s of Earthian power structure: three Powers. Religion, the State (government), Mammon (Money). That’s your enslaving power base. Struggle between these three is on-going, relentless, as long as the System exists, they will fight each other, sometimes joining two against one, but that only temporarily. History bears this out. Today we’ve basically reached the end of Money’s short rule. Next in line: Religion again, hence why the global turmoil by religious adherents to push their Power forward as the one to sit on the global throne. On the surface, Christianity seeks to regain its lost status from Catholic hegemony days. Islam wants to take that place, of course. But from what I hear, there is a massive resurgence of Buddhism in China. Contrary to popular belief, Buddhism is not a peaceful religion, it’s just another part of Religion, so there may soon be rumblings from that part of the world as the last vestiges of State communism vanishes. ‘Nuff said on that – too much info to elaborate. On another point made here: all religious forces of necessity tend towards a theocratic “state” or regime. That’s their nature. Those who think otherwise; who go through their quiet religious ablutions without thinking about the ramifications are deluded: they are part and parcel of the struggle to establish Religion as the supreme ruling Power. There is no difference between Islam or Christianity at all: same s**t, different pile. Here’s the problem for man, in a nutshell: either “he” will turn against his three Powers and go it alone, or his struggle will never end. You can’t end Religion if you continue supporting the State in some preferred type of governing authority, or if you believe some form of monetary policy can help man or his world; i.e., if you put your faith in any of those as a legitimate ruling force. That’s the part very few Earthians can wrap their mind around. It can be done, of course, but only through self-empowerment. That’s a big step for an enslaved species. Probably too big a step. Sounds like it’s our obligation to make sure such a person never sets foot in the Oval Office outside of a White House tour. I have yet to find this description inaccurate. They do like the words “he” and “his,” don’t they? I had read the quote from John Jay on the AFA website: ‘It is the duty, privilege and interest of our Christian nation to select and prefer Christians for their rulers.’ It’s time we took his advice.” What I find interesting is they left out the part about John Jay and how he argued unsuccessfully for a prohibition against Catholics holding office. Seems like his quote only applies to the “right” sort of Christians. If AFA believes in family, then where they when workers are striking for better wages, affordable medical care, pensions, good paying jobs, right to have a union, wealthy people and corporations paying their taxes and investing in America? Then there is America’s great ally Saudi Arabia,who provided 15 of the 19 hijackers for 9/11 and still separates peoples hands and heads from their bodies for violations of religious text! The AFA and it’s minions still believe in biblical punishments like stoning, well, stoning others for their transgressions, not themselves of course. Their deity says, don’t kill, they kill. Their deity says, don’t steal, they steal. Their deity says, do not covet, boy, do they covet. Their deity says, don’t bear false witness, they’ll bear false witness at the drop of a hat to get their way. They are just as false as their modern day profit’s, oh sorry , I meant prophets! The AFA should support biblical punishment for white collar criminals and corporations. Great and on target article, Valerie. It’s a shame the Religious Reich want to be so cruel and hateful, as well as forcefully impose their views on others. Sha ‘Tara – April 8th. The generalization that “Bible worshipers care not a whit about what Jesus said” is most certainly not generally true. I do understand what was meant; but I know many, many Christians who care deeply bout what “Jesus Said,” and who consequently use the best of it devote their available energies to helping others in secular manner and venues, (And who also maintain a very high standard of honesty in every sector of their lives). Including a few members of my own extended family who lovingly disagree with me. And, I’m generally not prepared to subscribe to any other generalization about the structure of our planet’s self inflicted survival woes. Yes clearly, money grants power, and religious zeal for power is, likely, generally corruptive of the religion. So, let’s work on overturning “Citizens United,” supporting all efforts to keep “Church and State” separate; and defending the Mother Nature upon whom we depend for our lives.